When I picked up our CSA share this week I was told I could pick all the zinnias I wanted. They were so beautiful and I felt like I was being a zinnia hog so I stopped at one bouquet. But now I wish I had picked more! Lovely colors esp when perennial flower color in the garden is starting to wane a bit. I am really enjoying my magenta and pink Cosmo ‘Sensation’ and marigolds right now. 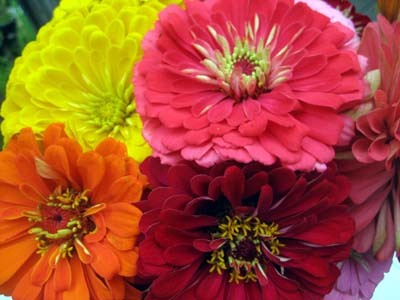 BEAUTIFUL…someone should create a hand-dyed yarn and name them “Zinnia”! Zinnias are a favorite of mine. They are always in every garden I plant and they really remind me of Grandma whose house was filled with them every summer. It was often my job to go out and pick them for the supper table. Sometimes I get to choose between flowers or the homemade goat cheese. Love your new monkeys – what yarn are you using? Oh WOW! I love the colors. Zinnias are one of those flowers that get lost with all the other flashy ones out there but remain a favorite of mine. They’re going on my list of to plant next year. being a zinnia hog is a good thing 🙂 It never got warm enough here this summer for mine to bloom – thanks for the photo! Oooh, I love the yellow one! I’ve been pleasantly surprised by how sturdy zinnias are to grow, ours are huge and keep growing and blooming despite the drought and heat. I can’t wait to see what they do next year after self-seeding! Finally – a flower I recognized! Have a great weekend too! I miss having zinnias in the late summer. Lucky you! I just went out and chopped a bunch of my zinnias down. They have done so well for me this year, and I figure my time with them is limited, so I’m going to enjoy as many of them indoors as I can. So pretty! My favorite colors are blue and purple with a touch of green, or red and pink with a touch of orange, depending on what’s caught my eye lately. I’m definitely going with reds today. I love zinnias! They are so perky! Okay, this is an elementary question, but what does CSA stand for? I’m always seeing it, I guess I understand the concept, but I have no idea what it stands for. I love, love, LOVE giant zinnias. I’ve got to plant some next year. Was going to this year, but time has gotten away from me. Maybe I should just get some mums and those pretty cabbages….